Happy fall everyone! Tis the season of vibrant colors, warm spices, hot breakfasts, and pumpkins, of course. Despite the changing of weather, I’m still making smoothies! There's nothing more I love than waking up to a delicious and nutritious breakfast. It’s a great way to start the day and to provide a boost of energy! Today, I’m making a toasted coconut ginger smoothie. It’s both creamy and refreshing. I use spinach, frozen banana, mango, coconut flakes, coconut oil, and ginger. The coconut oil is optional, but it just amplifies the coconut flavor. The banana and mango help thicken the consistency while also adding a tropical sweetness. I love adding raw ginger to smoothies especially when fall comes around, because as the cool, dry air starts to irritate the throat, ginger creates a burst of heat and immediately soothes any inflammation. Between the zing of the ginger and the creaminess of the coconut, this smoothie will certainly leave you feeling refreshed and awakened. For the coconut milk, I used Toasted Coconut milk from Califia Farms. It has a slightly enhanced and nutty flavor. You could use, however, any coconut milk you like. Using a full-fat coconut milk would intensify the flavors and richness, but I would some water to dilute it a bit.T here are now so many varieties now to choose from. I topped this smoothie bowl with sliced banana, raw pistachios, gogji berries, coconut flakes, and toasted buckwheat groats. 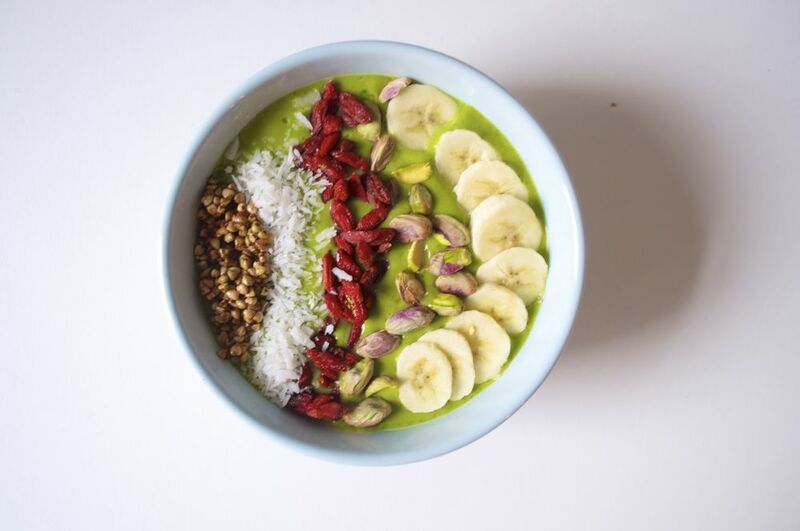 Full of color and flavor, this smoothie bowl will surely satisfy both the eyes and the stomach. Hope you enjoy this recipe! Let me know how it goes in the comments below and share your smoothies on Twitter and Instagram using the hashtag #friedparsley! In a high-power blender, add the coconut milk, spinach, banana, mango, coconut flakes, chia seeds, ginger, coconut oil, and ice. Blend until smooth. You can add more coconut milk for a thinner consistency and more banana for a thicker smoothie. 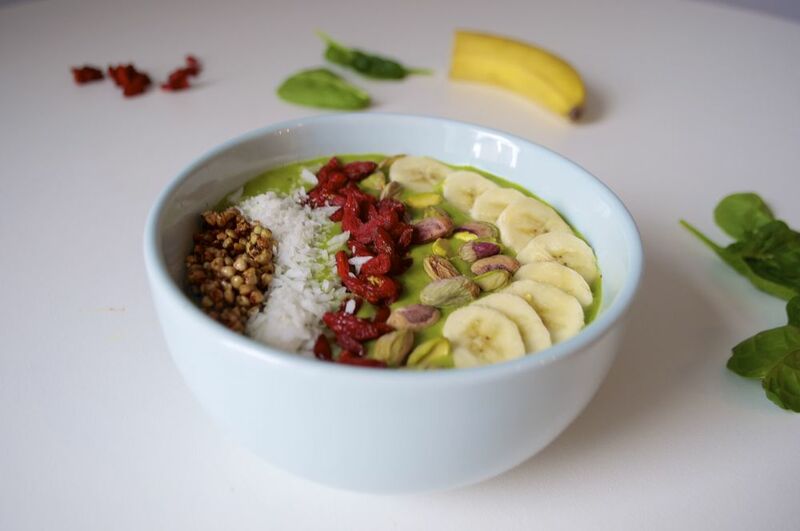 Pour the smoothie in a bowl and top with sliced banana, pistachios, goji berries, coconut flakes, and buckwheat groats. To toast the groats, place them in a saucepan over medium high heat and cook until golden brown. Add a pinch of cinnamon and a dash of agave (and a tiny pinch of salt) for extra flavor. You can add whatever toppings you like or just enjoy the smoothie by itself. Enjoy!